In my post here, I have elucidated the upgrade done on top of the “Custom Program to find out the Function module exits and BADIs associated with a particular Transaction Code”. 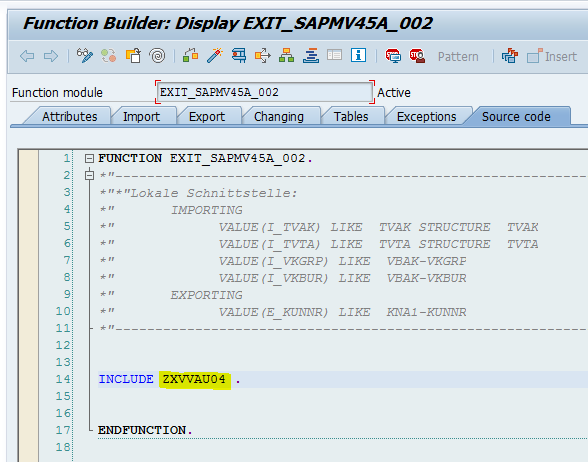 1) For the input given as VA03 (Display Sales Order) Transaction code in the selection-screen of the program ‘YMS_USEREXITBADITEST’ as per the above wiki link – it would display only the SMOD Transaction code Enhancement names (say V45A0003) under the Enhancement section as shown below. Here the missing factor is that the CMOD Transaction code Projects corresponding to these Enhancements are missing, thus forcing one to follow a strenuous time-consuming process in order to infer if any function module exit Z* inlcude is customized or not, by navigating into each of the Enhancements via SMOD Transaction code, using the hot-spot enabled. 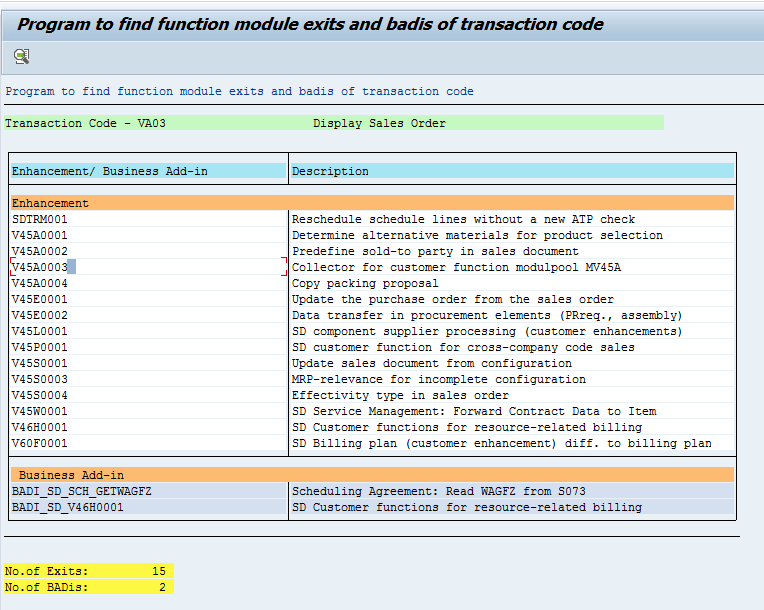 2) Similarly the output shows the BADI names corresponding to the Package ‘VA’ of Transaction code Input as VA03, under the Business Add-in section above. While here, the missing factor is that there is no further information on the Implementation status of these BADIs. This leaves us again with a time-consuming approach to navigate into each of the BADI names and infer the details of their implementation one after the other, using the hot-spot enabled in the above report output – that navigates to SE18 Transaction code. 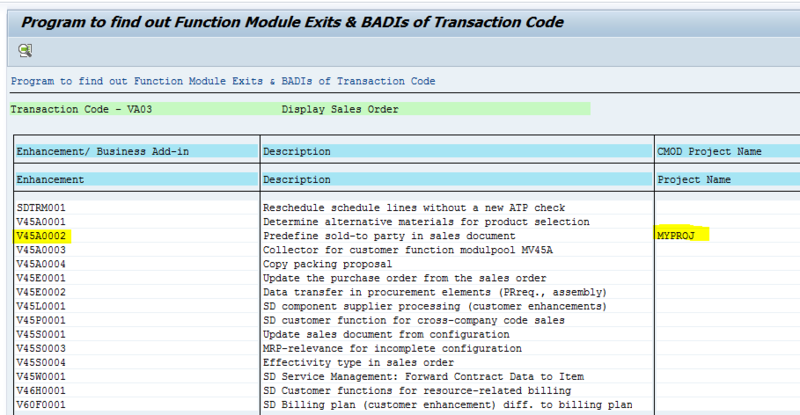 The above missing factors have been incorporated in a new custom program and hence we would enable SAP Consultants to save a lot of their time in the case of brownfield SAP Support / Implementation Projects with many Customizations / Enhancements in it, as they try to find out the implementation of function module exits & BADIs of any Transaction code. Now in the enhanced version of this report, a new column has been added in the output as CMOD Project Name. So in this case, the Consultant will be able to infer that for VA03 Transaction code, the only Project created is MYPROJ w.r.t Function module exits implementation – while there are around 15 SMOD Enhancements as listed above, thus saves us a lot of time. Also, when we select the corresponding enhancement V45A0002, which is hot-spot enabled it takes us to the CMOD Transaction code and clearly depicts below the Function module exit status as implemented. It has a Z-include ZXVVAU04 as shown below. PFB the custom logic implemented, inside the include ZXVVAU04. Under the BADIs (Business Add-in) section, there are two BADIs listed. While for the first one, there is no BADI Implementation done and for the second – the BADI Implementation (YBADITEST) is available. In addition to the Custom BADI Implementation name, we also find its desctiption, its status and Filter value (if any) in this comprehensive Report output with all these technical details. 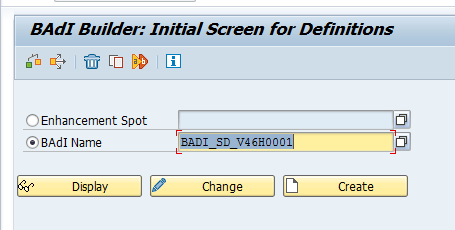 Also, hot-spot is enabled on the BADI name BADI_SD_V46H0001, which helps us navigate into SE18 Transaction code as shown below. *DATA : JTAB LIKE TADIR OCCURS 0 WITH HEADER LINE. c_x TYPE c VALUE ‘X’. FORMAT COLOR COL_POSITIVE INTENSIFIED ON. IF it_impl IS NOT INITIAL. LOOP AT it_impl INTO wa_impl. WRITE:/(130) ‘No userexits or BADis exist’. WRITE:/(130) ‘Transaction does not exist’. READ TABLE jtab INTO wa_tadir WITH KEY obj_name = sy-lisel+1(20). IF wa_obj IS NOT INITIAL. WITH ‘No Project is created for Enhancement’ sy-lisel+1(10). SET PARAMETER ID c_exn FIELD sy-lisel+1(20).